Whenever I use Therapi Honey Skincare’s Ultra Radiance Propolis+ Cream, I’m reminded of long ago when I used to use Creme De La Mer Moisturizing Cream. The rich texture is similar, as is the decadent feeling of luxury when applied, but the similarities between the two creams ends there. Therapi’s Propolis+ Cream is a far superior product IMO: it uses organic ingredients and does not contain fillers; it can hydrate, nourish, brighten and repair far better than La Mer; and the price is two thirds less! To this day, I am stunned whenever I see people raving about La Mer when there are far more efficacious and less expensive options out there! 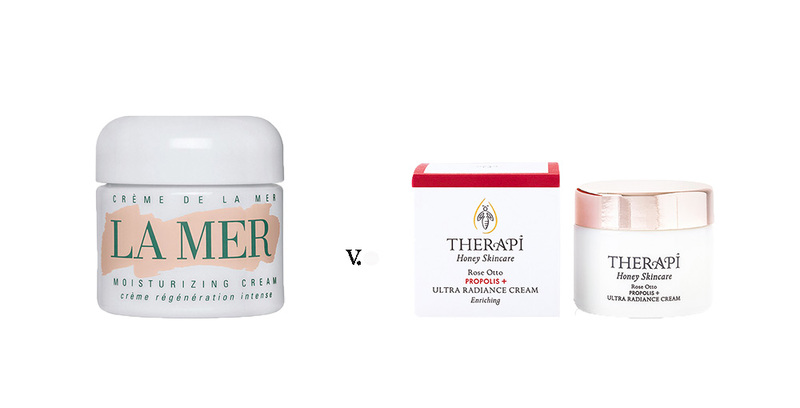 In this blog piece, I’m do a side by side comparison of the two creams based on ingredients, texture, results, value, and explain why IMO Therapi’s Ultra Radiance Propolis+ Cream is the green swap for La Mer’s Moisturizing Cream you will be happy you made. Both creams have a very thick, rich texture. Both need to be applied in a similar fashion to ensure you don’t overuse the decadent creams: scoop out a pea sized amount of product, pat between the fingertips of both hands and then pat and press around the face. The La Mer is slightly thicker than the Therapi Propolis+ Cream. But both absorb well and feel nourishing, never heavy, on the skin. Now, both of these ingredients are safe to use on the skin in the general sense. They aren’t like parabens or phthalates, which studies have linked to endocrine disrupting capabilities, but they aren’t good for the skin, and can actually damage the skin’s ability to hydrate itself. Mineral oil and petroleum are used in skincare products because they are colorless, odorless and create a seal locking in moisture (not to mention they’re incredibly inexpensive), but that seal is sort of like plastic wrap sitting on the skin that can disrupt the skin’s natural ability to hydrate itself, sweat, shed skin cells and breathe. They don’t clog pores since the molecular structure of these ingredients is too large to slip inside of the pore, but the seal they create can trap debris inside of the pore causing breakouts. I personally run whenever I see mineral oil or petroleum on a skincare ingredient label. Now, compare La Mer’s ingredient deck to Therapi’s Propolis+ Cream and it’s like night and day! 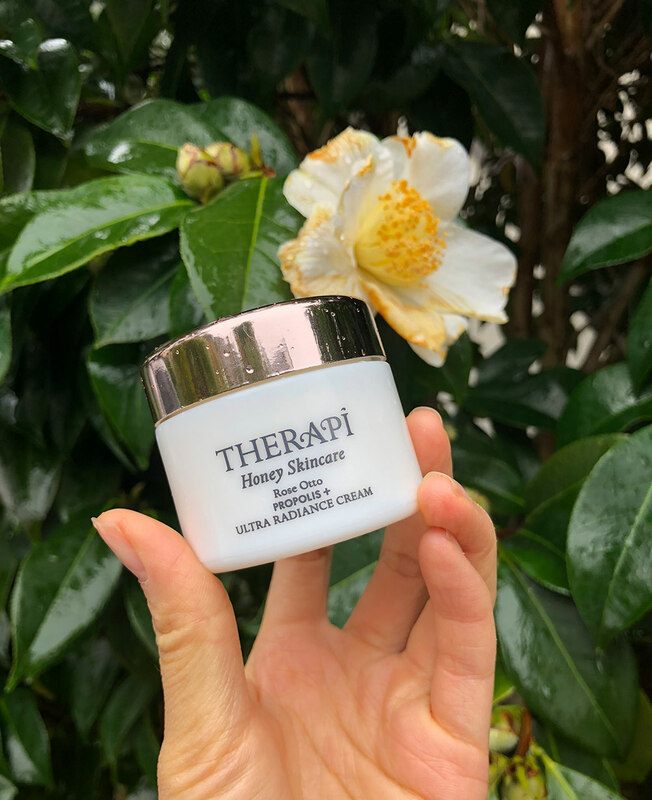 The Therapi Ultra Radiance Propolis+ Cream uses high quality, organic ingredients that are very powerful: rose water, rosehip oil, jojoba oil, (my fave) shea butter, rose geranium oil, beeswax and the star ingredient – PROPOLIS. An example of this power can be witnessed in the event a mouse gets into the hive, which Tanya explained to me quite often happens. The bees are able to sting the mouse to death, Tanya explained, but seeing as it’s too large for them to remove physically and a decaying mouse inside the hive could bring bacteria and disease, the bees mummify the mouse with propolis completely protecting themselves from disease, bacteria and pathogens that would arise from the decaying rodent. When it comes to hydration, both creams give a hydrated feel to the skin, but Therapi’s Propolis Cream goes beyond hydration. With its powerful star ingredient, propolis, it can brighten dark spots, reduce redness, soften fine lines, and combat dehydration by providing the right blend of water, oil and waxes that the skin needs. I personally have experienced fading of red acne spots and an overall brightening of my skin whenever I’ve used this cream and though I can’t use it year-round (since my life as a beauty blogger means I am constantly rotating products every month) – if I could, I would. This section is a no brainer. The Creme De La Mer Moisturizing Cream is $180 for a 1oz jar?! Ri-di-cu-lous. Whereas Therapi Honey Skincare Ultra Radiance Propolis Cream is $65 for a 1.7oz jar.